Guards of honor carry a photo of Brig. Gen. Abdul Raziq, Kandahar police chief, at his burial ceremony in Kandahar in October. Afghan commando Maj. Shoaib Moradef, 33, died on Sept. 2 in a military airplane accident in Mazar-i-Sharif, in northern Afghanistan. 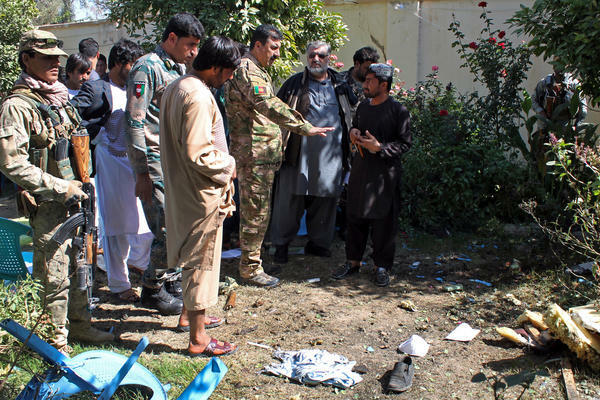 Security forces investigate an explosion that killed Abdul Jabar Qahraman, a candidate in parliamentary elections, at his home, in Lashkar Gah, the capital of southern Helmand Province, in October. U.S. Lt. Col. William Clark (second from left) talks with Brig. Gen. Abdul Raziq, then serving as the border police commander for southern Afghanistan, during a joint patrol along the border with Pakistan in 2009. The leading cause of civilian casualties was the use of improvised explosive devices, according to the U.N. There were suicide attacks and bombings at voting centers, schools and mosques. And there were U.S. airstrikes. It all took place in this, the 17th year of America's longest war. U.S. combat troops have been in Afghanistan for nearly double the time they were in Vietnam. And the war has touched generations of Afghans. Of the thousands of lives lost this year, three stand out. The lives and deaths of these three Afghan men help tell the story of Afghanistan and shed light on the challenges the U.S. faces there. To be a commando in Afghanistan is a great accomplishment and honor. Commandos are the nation's special forces, the best trained and equipped personnel in a military that struggles for resources. They make up a tiny proportion of the armed forces. Both the U.S. and Afghanistan want to increase their numbers by the thousands. 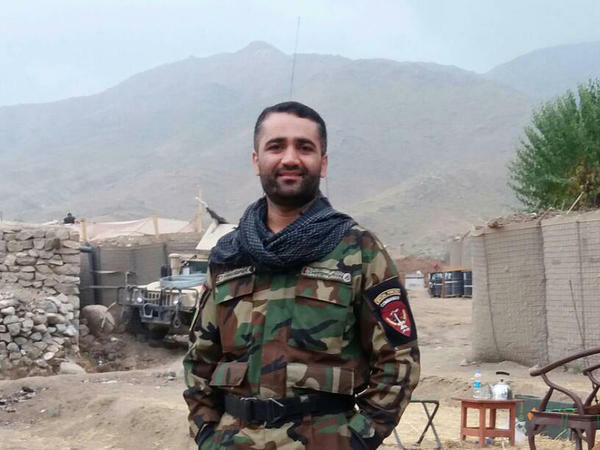 Maj. Shoaib Moradef, who died at age 33 on Sept. 2 in a military airplane accident in northern Afghanistan, was a commando. 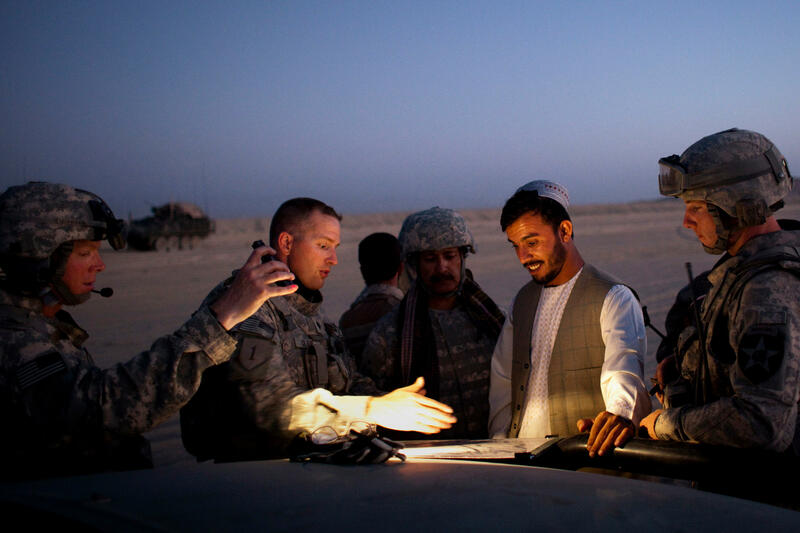 He was a patriot and a U.S. ally whom NPR first met in the late spring of 2016, when he was in charge of planning all missions for his unit in Kandahar. He worked side by side with American Green Berets, was fluent in English, well-traveled, razor-sharp and fearless. Moradef trained every day. He was a fast runner. He knew his men. And he was entrusted with some of the hardest missions. In January, when Taliban gunmen stormed Kabul's Intercontinental Hotel, Moradef and his men helped secure the hotel. It took them 14 hours. Moradef also fought ISIS in Nangarhar Province for weeks at a time. He nearly died twice: once from an explosion and another time from an airstrike that missed its intended target. His final mission, in August, was helping flood victims and negotiating peace talks between a warlord and Taliban forces in Faryab Province. Moradef brought them all together in a room. They even stopped fighting for a while, something he told NPR made him proud. Abdul Jabar Qahraman, a former general, was running for election to Afghanistan's parliament when he was assassinated on Oct. 17 by a Taliban bomb in his office in Helmand Province. By all accounts, Qahraman had been one of the most powerful men in the province. In 2016, President Ashraf Ghani appointed him as his special envoy to Helmand and put him in charge of security in the most violent area in the country. But he didn't last long in the job. And many distrusted him. He had served as a commander in Afghanistan's Soviet-backed military in the 1980s and as a pro-government militia leader in the early 1990s, according to the Afghanistan Analysts Network. Then he went into exile in Russia. He returned to Afghanistan after the fall of the Taliban and reinvented himself as a politician. According to Afghan officials, he had ties to Pakistani intelligence. U.S. intelligence told NPR he was "dirty" (and referred to him with an expletive) and suggested he was involved in the illicit drug trade. Qahraman worked deals with the Taliban at the same time he was negotiating with the U.S.-backed Afghan government. He sought U.S. help in neutralizing his rivals in Helmand, and hardened his opposition to the U.S. after the Americans refused to help him. Investigators said he was linked to a Taliban attack on an Afghan military convoy carrying four NPR journalists. The convoy was ambushed on June 5, 2016, as we rode from Lashkar Gah, Helmand's provincial capital, to the town of Marjah. NPR photographer David Gilkey and our Afghan colleague Zabihullah Tamanna were killed in the attack. A day after the Taliban bombed Qarahman in his office, another Taliban attack in southern Afghanistan made headlines. In Kandahar, a teenage Afghan guard allied with the Taliban shot and killed Brig. Gen. Abdul Raziq while he was meeting with American generals, one of whom was wounded. Raziq was born in Kandahar. Like many Afghans in the south, he did not know his exact birth date. In 2011, he took on a difficult job as Kandahar's provincial police chief. He was maybe 35 at the time. In the years that followed, he became one of the most powerful commanders in the country. Raziq bragged about the many times the Taliban tried to kill him, pointing to a burned spot on his hand — a scar from a Taliban bomb. In May 2015, surrounded by his armed guards, he told NPR how he pushed the Taliban out of Kandahar. "Now I can drive with you guys until 90 kilometers from here. You cannot find any Taliban there," he said proudly. The American military called Raziq a great ally. But like many Afghans, he didn't want any foreign power to control his country. Raziq kept the peace in Kandahar for seven long years. But he was implicated in the drug trade. And he could be brutal. He was accused of torturing those he arrested, using electric shocks and sometimes power drills. He executed prisoners without trial. The U.N. and human rights groups denounced him. Some in the Afghan government and even in the U.S. government wanted to cut ties with him. Raziq said the choice was between him and the Taliban. "What we are doing in this country is for law enforcement," he told NPR in 2015. "If serving for the people is like crime, then I have to go to my people and ask them what they decide about me." After that interview with Raziq ran on NPR, one U.S. officer told NPR: "If it wasn't for Raziq, the Taliban would be at the gates of Kandahar Airfield," the American base. Another, referring to Raziq, said bluntly: "We created that monster." 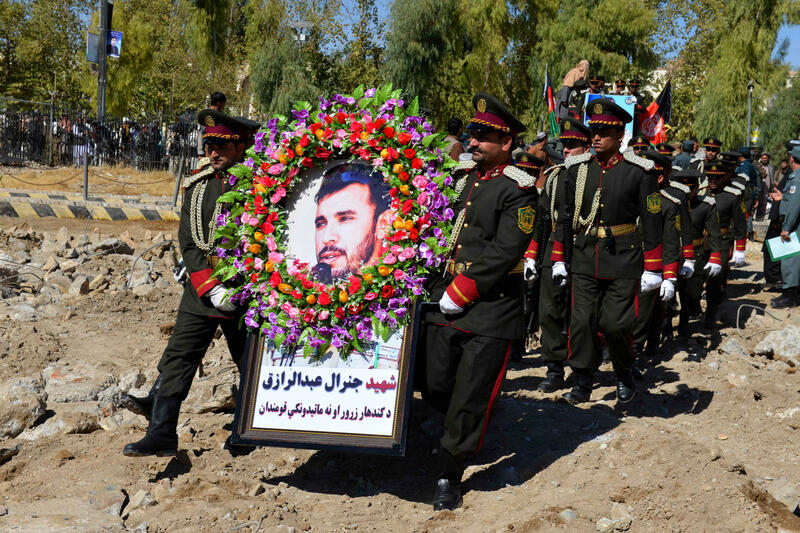 If Qahraman actively opposed U.S. involvement in Afghanistan and Moradef proved to be a selfless ally, Raziq — like many of his fellow Afghans — navigated the large space in between. Afghanistan is America's longest war. Combat troops have been there nearly double the amount of time they were in Vietnam, and the war has touched generations of Afghans. Let's look back now on the year in Afghanistan. And we'll do it through the lives of notable Afghans who died. Here's NPR's Pentagon correspondent Tom Bowman and NPR producer Monika Evstatieva. MONIKA EVSTATIEVA, BYLINE: This past year in Afghanistan has been deadly, even for this war. UNIDENTIFIED PERSON #1: Breaking overnight, twin suicide bombings killed at least 21 people in Afghanistan. UNIDENTIFIED PERSON #2: Police say a suicide bomber detonated explosives at the doorway of a voter registration center. UNIDENTIFIED PERSON #3: A suicide squad of six Taliban fighters terrorized the Intercontinental Hotel for 14 hours over the weekend. EVSTATIEVA: Nearly 9,000 soldiers and police officers were killed and 3,000 more civilians. TOM BOWMAN, BYLINE: Suicide attacks, bombings and a lot more American airstrikes. EVSTATIEVA: Today, we want to tell you about three Afghans who died in 2018. BOWMAN: Who they were tell you a lot about Afghanistan. Each represents, in their own way, the country and the challenges the U.S. faces there and why this conflict has lasted as long as it has. EVSTATIEVA: Let's start with a true Afghan patriot and a clear U.S. ally. BOWMAN: And someone we had really relied on. SHOAIB MORADEF: My name is Capt. Shoaib Moradef. I am from north of Afghanistan. I am from Panji province. BOWMAN: Oh, it's beautiful. I've been up there before. Very nice. MORADEF: That is a beautiful valley, yeah. EVSTATIEVA: We first met Shoaib Moradef when we did a profile of Afghan commandos in the late spring of 2016. BOWMAN: To be a commando in Afghanistan is a great accomplishment, an honor. They're the nation's special forces, the best-trained and -equipped. And now the U.S. wants to increase their numbers by the thousands. EVSTATIEVA: Shoaib was in charge of planning omissions for his unit. He struck us right away - fluent in English, well-traveled, razor-sharp and, most strikingly, fearless. BOWMAN: He was not a big guy, especially apparent when he was working side by side with the huge American Green Berets. And the funny thing - he was really mild-mannered. EVSTATIEVA: But he was a strong soldier. He trained every day. He ran fast. He knew his men. And he was always given the hardest missions. UNIDENTIFIED PERSON #4: Gunmen stormed the Intercontinental Hotel in Kabul on Saturday night. The Taliban says its fighters were searching for government workers, security forces and foreigners. BOWMAN: It was Shoaib and his men who helped secure the hotel after a half day of fighting. EVSTATIEVA: He fought the Taliban and even ISIS for months at a time. He nearly died twice - once from an explosion and another time from an air strike gone bad. BOWMAN: His last mission wasn't even fighting. He was helping flood victims and also negotiating peace talks between a warlord and Taliban forces. EVSTATIEVA: He got them all together in a room. They even stopped fighting for a while. He was proud. BOWMAN: Shoaib died in September 2 in a military aircraft accident in northern Afghanistan. He was only 33. EVSTATIEVA: Shoaib was a good guy - someone who cared about his country, someone the Americans could work with and someone we counted on as we reported on this war. ABDUL JABAR QAHRAMAN: (Foreign language spoken). EVSTATIEVA: The next person we're remembering today claimed to work for the common good but really only cared about himself. BOWMAN: Abdul Jabar Qahraman was in his mid-60s. This year, he ran for Parliament. A Taliban bomb killed him in his office in Helmand Province. EVSTATIEVA: Qahraman was a chameleon. Before he got into politics, he was a military man - a general. In 2016, President Ashraf Ghani made him his special representative in charge of security in the most violent area in the country, Helmand province. BOWMAN: He was a dangerous man. Over the years, he worked for the Russians and spent years in exile in Russia. We are told he had ties to Pakistani intelligence. American intelligence told us he was dirty, involved in the drug trade. Investigators told us he was linked to an attack on a convoy we were riding in back in 2016. EVSTATIEVA: But by all accounts, he was one of the most powerful men in Helmand province until his death on October 17 in that Taliban bombing. BOWMAN: The very next day, another Taliban attack in southern Afghanistan. UNIDENTIFIED PERSON #5: General Scott Miller escaped unharmed in the attack in Kandahar when an Afghan bodyguard shot dead Gen. Abdul Raziq - one of the country's most powerful commanders - during a critical week here. EVSTATIEVA: Brig. Gen. Abdul Raziq was born in Kandahar. But like many Afghans in the south, he did not know exactly when. BOWMAN: In 2011, he took on a difficult job - he would be Kandahar's provincial police chief. He was maybe 35. EVSTATIEVA: Raziq was not easily scared. He bragged about how many times the Taliban tried to kill him. BOWMAN: I recall him pointing to a burnt spot on his hand - a scar from a Taliban bomb. I had a long interview with him at his estate in May of 2015, surrounded by his armed guards. He talked about how he pushed the Taliban out of Kandahar. ABDUL RAZIQ: (Through interpreter) But now I can drive with you guys until 90 kilometers from here. You cannot find any Taliban there. EVSTATIEVA: But that voice was not his. It's of the late journalist and our friend Zabihullah Tamanna, who died together with our colleague photographer David Gilkey in that convoy attack we mentioned earlier when we were talking about Qahraman. BOWMAN: Right, Qahraman the chameleon. If he was a foe to American involvement there and Shoaib was a friend, then this man, Gen. Abdul Raziq, was like a lot of Afghanistan - a complicated mix of the two. EVSTATIEVA: The American military called Raziq a great ally. He kept the peace in Kandahar for seven long years, but he was also brutal. BOWMAN: He was accused of torturing those he arrested, sometimes with power drills. He would execute others without trial. The U.N. and human rights groups denounced him. EVSTATIEVA: Some in the Afghan government and even in the U.S. government wanted to cut ties with him, but Raziq brushed all of that aside. He said the choice was really either him or the Taliban. RAZIQ: (Through interpreter) What we are doing in this country is for law enforcement. If serving for the people is like crime, then I have to go to my people and ask them, what do you decide about me? BOWMAN: After that clip ran in a story I did, I had one Army officer say to me, Tom, if it wasn't for Raziq, the Taliban would be at the gates of the American base in Kandahar. But another told me bluntly, we created that monster. EVSTATIEVA: Gen. Abdul Raziq was killed on October 18 by a teenage Afghan guard who was also with the Taliban, during a meeting with American generals, one of whom was also wounded. EVSTATIEVA: And the people like Shoaib who do not want to give up on staying and building a better country. BOWMAN: In this year's elections, a record number of young men and women ran and won seats in Parliament. EVSTATIEVA: And this love for their home country is probably Afghanistan's best chance forward. FADEL: NPR Pentagon correspondent Tom Bowman and producer Monika Evstatieva.